Ukrainian police have foiled a plot to desecrate a relic of St. Andrew’s cross while it was being venerated in Kiev, the nation’s capital, according to the Russian news agency Interfax. 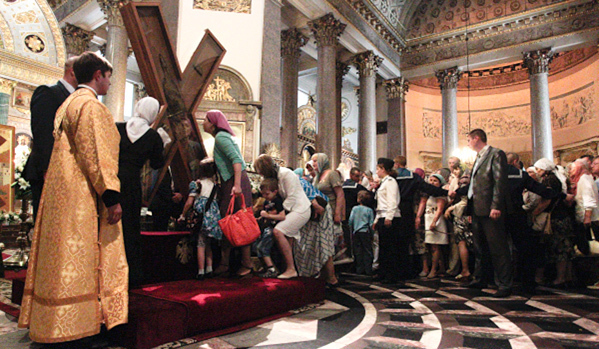 The relic, normally enshrined at the Greek Orthodox Basilica of St. Andrew in Patras, Greece, was being venerated in Russia, Ukraine, and Belarus to mark the 1,025th anniversary of the baptism of Kievan Rus’. According to a member of the Ukrainian parliament, members of FEMEN, a Ukrainian feminist group that engages in lewd anti-religious protests, disguised as nuns but were apprehended before they could carry out their plan to urinate and defecate on the relic.